Van lies in the community of Llanidloes Without in the county of Powys. It is located at Ordnance Survey national grid reference SN94258760. The mine is recorded in the CPAT Historic Environment Record as number 5936 and this number should be quoted in all correspondence. Lower Silurian Gwestyn formation and Ordovician Van formation shales and mudstones. The main vein strikes NE-SW with a northern branch. Mineralisation includes galena and zinc. These include five shafts, 3 adits and levels. Some early trial adits are located at SN94208810. 3 inclines were constructed up to Seahams shaft from the dressing floors. One of these inclines aided the haulage of coal to feed the engine. Others lowered ore to the crushers. An incline ran from the slimes settling tanks to the slimes dump. A standard gauge railway connection to Caersws was created in 1871 as a branch of the Cambrian Line for hauling concentrate as well as passengers. Much of this line still exists. A tramway embankment conveyed stone from the nearby quarry to Seahams shaft. Between 1865-1871 an extensive dressing and crushing plant was erected which consisted of two crusher houses, stamps, buddles, jiggers and slime pits. A halvans mill was added in 1876 for reprocessing the spoil tips. The plant included a unique set of steam driven stamps. A mineral separation brine plant built in 1912 exists as concrete foundations to the east of the main mine area and was later used as a paintworks in the 1930s. Also present on the mine site were a sawmill, coalhouses, carpenters shop, mine office and a loading bay or surge bin to hold ore trammed out of the main adit. 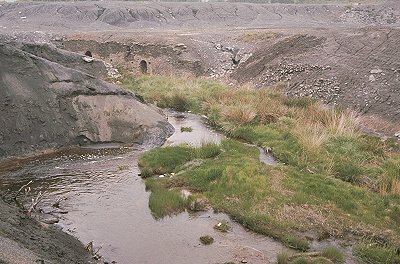 The Ceryst and other culverts diverted water from Llyn Y Fan through the dressing area. A large dam (SN92808780) was constructed in the valley to the west to provide water at the dressing floors. Many of the buildings within the village are former mining accommodation/ administration offices. The miners' chapel and associated library can be seen at SO94928770. Overall preservation of building remains on the dressing floors is good where the structures have been deeply buried in processing waste.